Our brewery was built on an attitude of no regrets. An attitude of taking risks to bring the best beer possible to our fellow renegades and rebels. Never brewing to style, but always brewing what we want to drink. 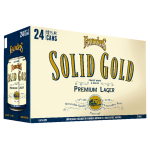 Our take on a classic, Solid Gold is a drinkable premium lager brewed with the highest quality ingredients. Challenging what a lager can be? That’s something we won’t regret. Copyright 2018 The Daily Growler.